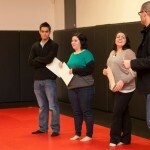 Rank promotions in Brazilian Jiu-jitsu, Judo, Krav Maga, and Kickboxing! 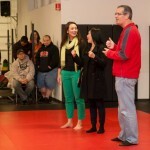 The Smash Gyms Holiday Party was highlighted with rank promotions for many deserving students. These students have worked hard and shown incredible dedication to their training. In Brazilian Jiu-jitsu….Jess Ramos, Rogelio Morales, Arturo Galano, Jay Gurusamy, Justin Cunha, and Wilson Yeung were promoted to blue belt by BJJ head instructor Michael Jen. These students have been training consistently for the past 2 years and have shown great progress in their skills on the mat. In Judo….Aaron Jen was promoted to the rank of yellow belt by Judo black belt Chad Himeda. 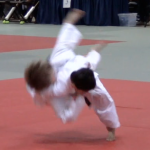 Aaron has done extremely well in judo tournaments and is eager to compete at the next level. In Krav Maga….Desiree Mendel, Sookie Ignacio, Hallie Fowler, and Gabrielle Blanc passed their test with flying colors and were promoted to Level 2 practitioner in Krav Maga. Krav Maga is most popular with women because you don’t actually spar live. Krav Maga doesn’t teach you how to fight, it teaches you how to avoid a fight! In Kickboxing….Gabriella Anaya, Meagan Eaton, Giselle Marie, and Suhas Harihar had passed the Level 2 kickboxing exam and were promoted by Kickboxing head instructor Brian Kuhn. All of them have shown great progress and Brian looks forward to taking their abilities even further. A big congratulations to everyone who was promoted and keep up the good work! Come join the Smash Gyms Holiday Party this weekend! Smash Gyms is holding its annual holiday potluck bash this Saturday, Dec. 15. Festivities begin at 1pm. Bring friends and family and come join us for food and fun!